United States Air Force Academy received a B+. U.S. News & World Report's ranking of 3 out of 10 of National Liberal Arts Colleges Top Public Rankings was a major contributor to this grade. The enormous campus of the United States Air Force Academy is located near Colorado Springs, Colorado, about 80 miles from Denver. USAF offers a range of educational options, from the liberal arts to engineering and technology, and students here get to become fighter pilots. 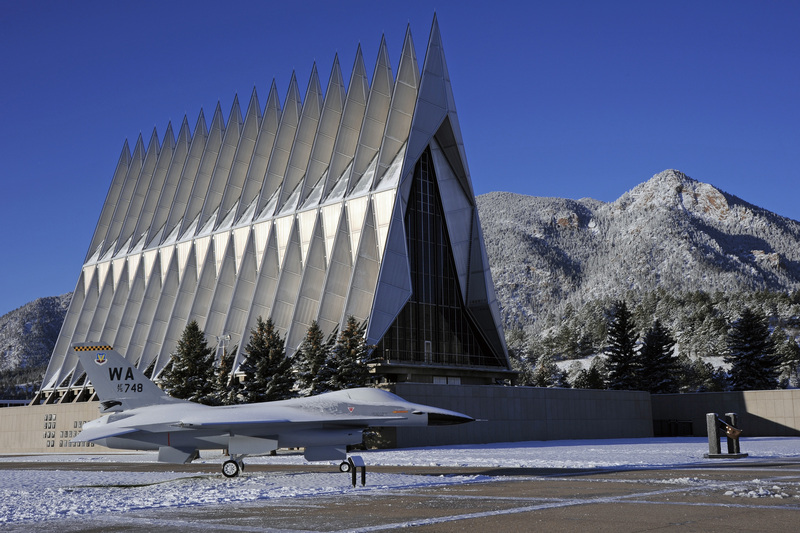 What are the top 3 reasons someone should attend United States Air Force Academy? What is a typical United States Air Force Academy student like? Describe the type of person that should attend United States Air Force Academy. Honor is valued quality at the academy, and admissions officers will accept only those with the strength of character. The United States Air Force Academy was established April 1, 1954, the culmination of an idea that had been years in the making. Airpower leaders, long before the Air Force was a separate service, had argued that they needed a school, dedicated to war in the air, at which to train the country's future Airmen. After September 1947, when the Air Force was established as a separate service, this idea finally had the legitimacy of the new service behind it. In 1948, the Air Force appointed a board, later named the Stearns-Eisenhower Board for its chairmen, to study the existing military academies and to study the options for an Air Force Academy. Their conclusions were strongly put: the Air Force needed its own school, and they recommended additionally that at least 40 percent of future officers be service academy graduates. After Congress passed the bill establishing the Air Force Academy, the secretary of the Air Force appointed a commission to recommend a location. After traveling 21,000 miles and considering hundreds of sites all over the country, the commission recommended Colorado Springs as its first choice. The secretary agreed, and the purchasing of the thousands of acres began. The state of Colorado contributed $1 million to the purchase of the land. On July 11, 1955, the same year construction began in Colorado Springs, the first class of 306 men was sworn in at a temporary site, Lowry Air Force Base, in Denver. Lt. Gen. Hubert R. Harmon, a key figure in the development of early plans for an Academy, was recalled from retirement by President Dwight D. Eisenhower to become the first superintendent. Two years later, Maj. Gen. James Briggs took over as the Academy's second superintendent. On Aug. 29, 1958, the wing of 1,145 cadets moved to its permanent site from Denver. Less than a year later, the Academy received academic accreditation and graduated its first class of 207 on June 3, 1959. In 1964, the authorized strength of the Cadet Wing was increased to 4,417. The present authorized strength is 4,000. Perhaps the most controversial event in the Academy's history was the admission of women. President Gerald R. Ford signed legislation Oct. 7, 1975, permitting women to enter the military academies. Women entered the Air Force Academy for the first time on June 28, 1976. The first class including women graduated in 1980. As with any institution, the Air Force Academy has suffered growing pains and continues to evolve. Even in its relatively short existence, the school has excelled in its quest for excellence. The Academy celebrated the 50th anniversary of its inception April 1, 2004. Three noteworthy events occurred in connection with the celebration. First, a 37-cent commemorative stamp was issued honoring the Academy, with the chapel strikingly portrayed. The Academy was also declared a national historic landmark, and a plaque was installed on the Honor Court marking the occasion. Finally, Harmon was officially named as the father of the Air Force Academy, honoring the pivotal role he played in its planning and establishment. Further anniversaries were marked during the next four years, culminating with the 50th anniversary of the first commencement at the Academy in 2009. The Academy has provided the Air Force with a corps of officers dedicated to upholding the high standards of their profession. The Air Force, in turn has provided a proving ground for these officers and sent back to its Academy dedicated staff members to educate and train these future leaders. Fifty years after the first class entered, the Academy has now graduated over 37,000 young officers' intent on serving their country. What are the top 3 things that students do for fun at United States Air Force Academy? Campus housing is available for undergraduates and is mandatory for freshman. No cars. No pets. 100% of students live on-campus. Any instructional program in military systems and maintenance technology not listed above. A program that focuses on the synthesis and study of organic or inorganic materials and their electronic, magnetic, optical or mechanical properties. Includes instruction in advanced materials for photonics, lasers, chemical sensors and arrays or nanochemistry; semiconductor nanowires; and molecular electronics. 88% of students graduated in the top quarter of their class. 62% of students graduated in the top tenth of their class. 84% of students graduated on time. 86% of students graduated in six years. The typical (median) early career salary of United States Air Force Academy graduates is $64,900, according to Payscale. United States Air Force Academy participates in the NCAA Division I-A for college athletics. Want more info about United States Air Force Academy? Get free advice from education experts and Noodle community members. Do you offer masters degrees online? All programs offered at USAFA are undergraduate and in person.